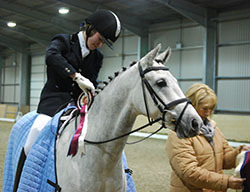 The Overall Champion was top 5 year old pony, the German-bred Rufus (pictured on left wearing his SPSS Thermatex Rug prize), ridden and owned by Francesca Walker. Reserve Champion was the 4 year old winner, the British bred Delaroche Birthday Girl (pictured below), ridden by Alice Perry, owned by Elaine Coleridge Smith and bred by Lucy Sheldrake. Two 4 year old mares, D.P.U.K. Boo2u2 (ridden by Lian Watson and owned and bred by Gill Jolleys) and Westhills Wrubyan (ridden by Helen Lowe and owned and bred by Mr & Mrs C Holmes) were equal 3rd overall. Overall Champion, Rufus is pictured on the left. Unless otherwise credited, all photographs are by kind permission of Hannah Owen. No pictures may be copied without the permission of the photographer. Overall Champion and Winner of the 5 Year old Class, Rufus, ridden and owned by Francesca Walker, won £75, a SPSS Thermatex rug, a SPSS polo shirt and SPSS cap. Rufus is a German Riding Pony registered in the Weser Ems studbook and was bred in Germany by Arno Panten. Rufus is by the German Riding Pony Renoir out of a mare by Nerz. 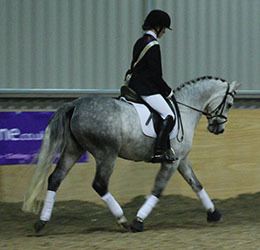 Francesca, of Blackington Stud, bought Rufus as a recently backed 3 year old who had done one ridden show in Germany. Since then, Francesca has been training him and would love to train him to FEI level if she has him long enough (as he was brought to bring on and sell) as she says he always tries hard when learning new things and so is both fun and rewarding to train. The Championship was only Rufus's 3rd show with Francesca and the busiest place he'd been to - as well as his first competition indoors, so Francesca was extremely pleased with how well he behaved. Reserve Champion and Winner of the 4 year old Class, DeLaRoche Birthday Girl was ridden by Alice Perry, and they won £50, a SPSS polo shirt and SPSS cap, a £20 SPSS Voucher for being the highest scoring mare and a SPSS Merit Award rosette and certificate for being the highest scoring SPSS registered pony. DeLaRoche Birthday Girl is known as "Dela" and she was bred by Lucy Sheldrake of DeLaRoche Stud. 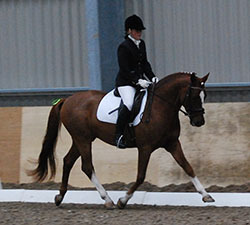 Dela is now owned by Elaine Coleridge Smith of Windmill Farm Dressage and Lindsay Coleridge Smith has been training Dela and her rider over the last year. Dela is by the SPSS graded stallion Bernwode Brokat, who in January 2010 was awarded a BEF Futurity Certificate of Merit for Sports Pony Leading Sire. Bernwode Brokat also sired the 2009 Mare Grading Champion Mademoiselle (who also competed in the 4 year old class) and the 2010 Stallion Grading Champion, Bernwode Broadway. Dela's dam, It's Herself, is a 15hh TB by Itsu who prior to going to stud was a successful show hunter pony and graded into the WBS Head Studbook. The £25 for 3rd place overall was split between the two British-bred mares who had been equal second in the 4 year old class - D.P.U.K. 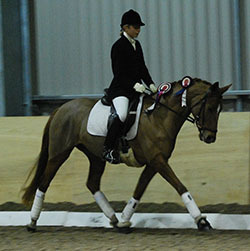 Boo2u2 (ridden by Lian Watson and owned and bred by Gill Jolleys) and Westhills Wrubyan (ridden by Helen Lowe and owned and bred by Mr & Mrs C Holmes). D.P.U.K. Boo2u2 was bred by SPSS members Dressage Ponies UK and is a SPSS Graded mare by Mooiman (KWPN) out of the British Riding Pony, Bowland Forest Ivy. Westhills Wrubyan is a chestnut mare by the Hanovarian, Longdean Westminster, out of Westhills Charlotte (SHB(GB) by Stanhopes Diddicoy). 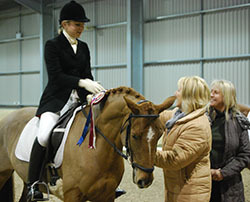 The £20 voucher for the highest scoring stallion was won by British-bred Rosewater I Claudius, a SPSS graded stallion, who was ridden by Lucy Northcott and bred by Lucy Northcott and Sarah Eberle of Rosewater Sports Ponies. "Claud" is by the SPSS Elite Graded stallion Caesar 171 who stands at Leamside Equestrian. Claud was awarded a 1st Premium in the 2009 BEF Futurity and is out of the German graded mare Delphi (by Dornick B). 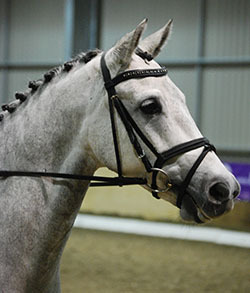 Caesar 171 is a 13.3hh bay stallion who graded in Germany before having a successful dressage career in the UK - including Team Silver and Bronze medals at the Pony European Championships and being British Dressage Restricted Medium Winter Champion in 2000. The SPSS Teddy (and rosette) for the youngest rider went to 12 year old Demi Leigh Mason who managed to stay calm even when Trevaliant Button Moon (by SPSS sire Littledale Bright Star) decided not to canter and still completed the test, although her mark had to reflect the lack of canter, it was good experience for both rider and pony. A rosette and SPSS cap was awarded to the only other rider under 16, 14 year old Christian Eley. Christian stood in for his injured mother at only a weeks notice so had only ridden the newly backed stallion Hilkens Gold Card five times before the competition (and that was after Gold Card hadn't been ridden for 3 weeks)!! 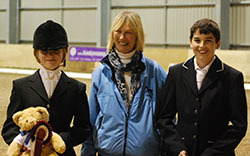 Demi Leigh Mason (on left) and Christian Eley (right) the 2 youngest riders with Sarah Steggall who presented the prizes. SPSS; Chestnut Mare; 29-Apr-2006. Sire: Bernwode Brokat (GRP/SPSS); Dam: It's Herself (Weatherbys/SPSS); Damsire: ITSU (USA). Country of Birth: UK. Breeder: Lucy Sheldrake. Owner: Elaine Coleridge Smith. Weser Ems ; Grey Gelding; 08-Feb-2005. Sire: Renoir (GRP); Dam: Nebelhexe (GRP); Damsire: Nerz (GRP). Country of Birth: Germany. Breeder: Arno Panten. Owner: Francesca Walker.